Reprint 2004, Dover Publications, Inc. 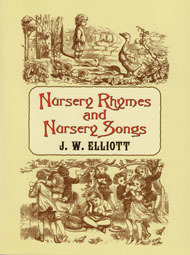 In 1870 J. W. Elliot published this definitive book of nursery songs and melodies. He collected 54 nursery rhymes and wrote melodies for each along with simple piano accompaniment. Many of these melodies are still well known today and have become almost inseparable from the original nursery rhyme. Beautiful engravings for each nursery rhyme were created by the Dalziel brothers. All of these nursery rhymes, melodies, arrangements, and engravings are in the public domain in the USA. PUBLIC DOMAIN STATUS: This Dover edition, first published in 2004, is an unabridged and unaltered replication of the work originally published by Novello and Company, London, in 1870. The melodies and arrangements of these songs were published in 1870 and the songs, music, lyrics, and arrangements are believed to be in the public domain in the United States.